Does the game ever say what route the gang took from Blackwater to Colter? They were coming west when they arrived at Colter, right? They went from blackwater northwest, then turned east and went through the mountains. Initially, they came from the west (literally more west than New Austin - potentially South Western Territory and Canyon City ). They then came over the mountains to the Blackwater region. Blackwater heist went bad so they escaped up into the mountains again. From Blackwater, they went northwest. I'm thinking they either went by Hanging Dog Ranch or Wallace Station which is the only two logically ways into Colter from Blackwater. Actually, they did not come by Wallace Station to get to Colter. The entered Colter from the north via Spider Gorge. 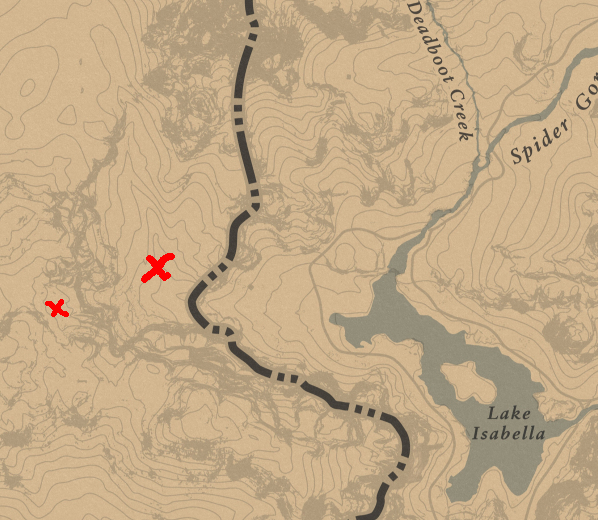 The got to Spider Gorge via the extreme NW of the rdr2 map from what ever state/country is NW of Ambarino there by Galcier. I don't know how to prove it without 'spoiler' type material but the post by smokewood is pretty much correct. So my guess for before the NW corner which is where we start rdr2. The gang went west and northwest out of Blackwater off of the RDR2 map into the countries/states north and west of West Elizabeth and Ambarino. I guess it is possible they went past Hanging Dog Ranch on the way out of Blackwater but that would have been a long time going north in West Elizabeth with the Law on their tail when he escape plan was to go west. This is still West Elizabeth yet the gang is not wanted north of the Upper Montana River so I can't think the Law chased them out of Blackwater through New Elizabeth up past Strawberry and Hanging Dog Ranch and then didn't bother to keep the wanted dead or alive status to look for them where they were last seen. I feel it is much more likely that they went straight west out of Blackwater to Tall Trees and crossed west into the mountains by Aurora Basin. The map I have is vague as to passes and crossings in that area but I think they made their escape to the west either by going north of the basin or across the Lower Montana south of the basin. Then they headed north off the map to the west side of the mountain range that forms rdr2 map's west edge before circumstances forced them to the start of RDR2 in the NW of the map.. My second thought it they would have gone south and west to flee through New Austin to cross the Lower Montana and get out of state before then heading northwest past MacFarlane ranch into the mountains west of the Aurora Basin, but John says he's never been to New Austin, so probably not even though I could hear arguments for not wanting to say "oh yeah I went through New Austin before, but I was on the run from the Law so I can't talk about it.". It would be easier to just deny all knowledge. And even if they did go past Hanging Dog Ranch to get to Colter I suspect they went North West up the Little Creek River off the map to go in a clockwise circular motion to get to Colter via the nw Corner instead of meandering up through Ewing Basin. Since Colm O'Driscoll and his lot that that area locked down. Again, the start of RDR2 has them moving se into Colter from the NW. Maybe this avalanche that's now outside the playspace was going to be used during their escape? Does your John have white hair or am I seeing things? He did have white hair, but only on the exposed sides, not under the hat. It's a weird FX thing I've seen happen to other people too. Well they must have got there via a route that was outside of RDR2's map. 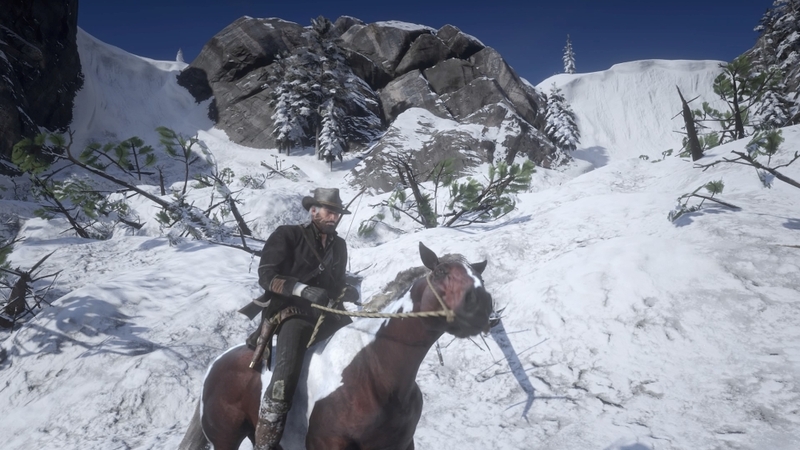 In the journal Arthur describes their journey up there was super treacherous to the point that no one could have possibly followed them, when in actual fact its pretty straight forward to get from Backwater to Colter and nowhere near as treacherous as he makes out. So I went back in this play through to check my theories and now I'm a little stumped. I finally got the mission to get the Pipe for Dutch, and in the conversation Dutch says that it was lost during the Blackwater escape. The results of the campfire story with Lenny is he lost his watch during the escape as well. Both are found at Vettter's Echo which is just south of the Hanging Dog Ranch. This causes continuity errors for me if we assume the gang was at that location during the escape. Since that leads to implying that the Little Creek route I discussed previously might be correct. But I traversed that route and it does not at all look like it would be passable to wagons. Which means I'm forced to assume that the watch and pipe were lost on the escape and found by some-one who took them to the cabin. But looking more and more makes me realize this map was created with no roads leaving the map to the west. I have found No-where in the universe would any regular folk cross west into the neighboring states, let alone a wagon train of outlaws. I mean I understand how for game play restrictions you have to have a map boundary. And mountains are super easy to do that with. However, does this work really? 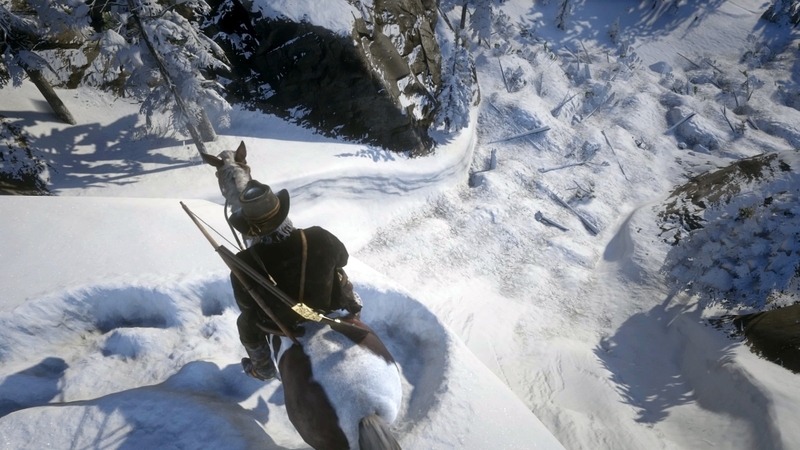 We already accept that as Arthur -without glitching- you can't cross into North Elizabeth south of the Upper Montana River because you are wanted Dead Or Alive and Bounty Hunters will kill you dead. Why isn't there a realistic road and rail network leading off the map into the west that has access blocked to the west for the gang by "Wanted Dead or Alive" prohibitions? Cross post looking at how the avalanche area and some other out-of-bound details could have been Dutch's escape route from Blackwater into the winter wilderness.